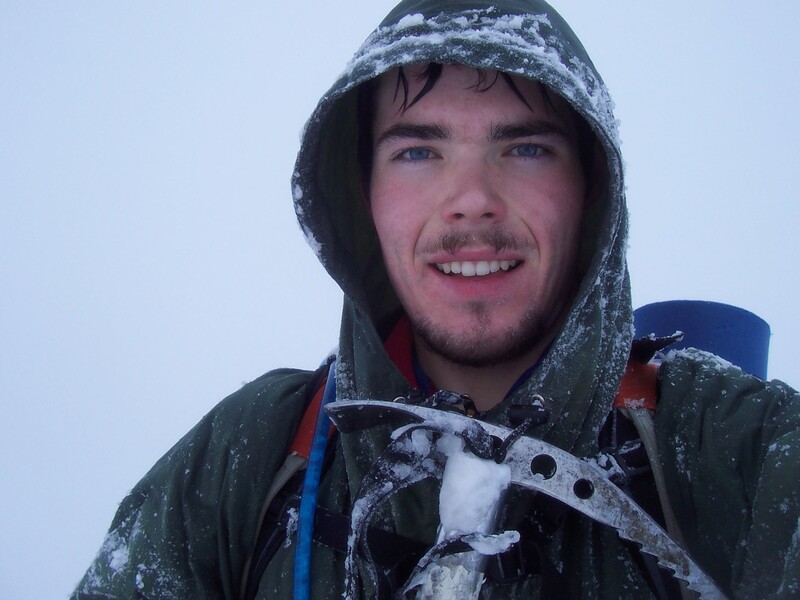 No rational person would choose to seal themselves in a nylon bag halfway up Ben Nevis, for ten hours, in a blizzard – but, for reasons which still aren’t entirely clear to me, that’s exactly what I found myself doing on the 27th of November, 2008. The night before went by in a bit of a blur. Like most nights after a shift at the Clachaig, we ended up in the Boots Bar with the shutters down and a game of pool on the go. Our freebie ‘staff pint’ of Black Gold soon turned into three or four, then five or six; pound coins piled up in half-pint glasses behind the bar, to be paid in to the till the next morning. Jack was demonstrating his legendary prowess with a pool cue, as usual. Then the talk turned to climbing. Let me tell you something about the Clachaig. It gets under your skin. Everyone who has spent time there can claim ownership of their own memories, but I think it’s more than that – it’s a protective bubble of energy and enthusiasm and legendary tales, and if you’re in that bubble then nothing outside it matters, or even exists. The laws of physics work differently there. That’s the only way I can describe it, and maybe that explains why everyone seems to think their version of the Clachaig is the definitive one, and it’s ‘all gone downhill since then’ (which is never actually true). But if you’re in the bubble, it’s the whole world. The urge to add to this corpus of collective legend is impossible to resist. So perhaps that’s why, several pints down after work, I loudly declared that I would climb Ledge Route on Ben Nevis after my housekeeping shift the next morning – despite a terrible forecast, and despite the fact that my shift patterns and the bus timetable never quite lined up. It was dark when I reached Fort William the next afternoon. Housekeeping had taken longer than expected – that tends to happen when the department is short-staffed and you have to make beds for half the hotel – and there had been delays on the main road due to the never-ending roadworks. I’d tried to hitch a lift into Glen Nevis to avoid the pouring rain but luck hadn’t been with me. As I walked along the pavement beside the road into the glen, I could sense the mountains closing in on me despite the thick cloud cover above and the total lack of light in the sky. It’s hard to describe how the shapes of mountains seem to imprint themselves upon you as you walk beneath them, whether or not they are visible. The effect is magnified in winter, when walking to the crag in the dark is the norm; you can feel the presence of great mass, even if none of your senses detect it directly. Nowhere is this more true than Ben Nevis. As I began to climb the steep path from Achintee, the mountain’s bulk, above and ahead, drew me onwards as if by magnetism. My plan was extremely sketchy. I had a rucksack with a sleeping bag and nylon bivvy bag, a little food, and my winter climbing gear. Despite my bravado in the pub, this was not a major expedition – Ledge Route is just about the easiest route on the north face of Ben Nevis, and one that I’d climbed before, albeit in benign summer conditions. I didn’t expect it to put up much of a challenge. 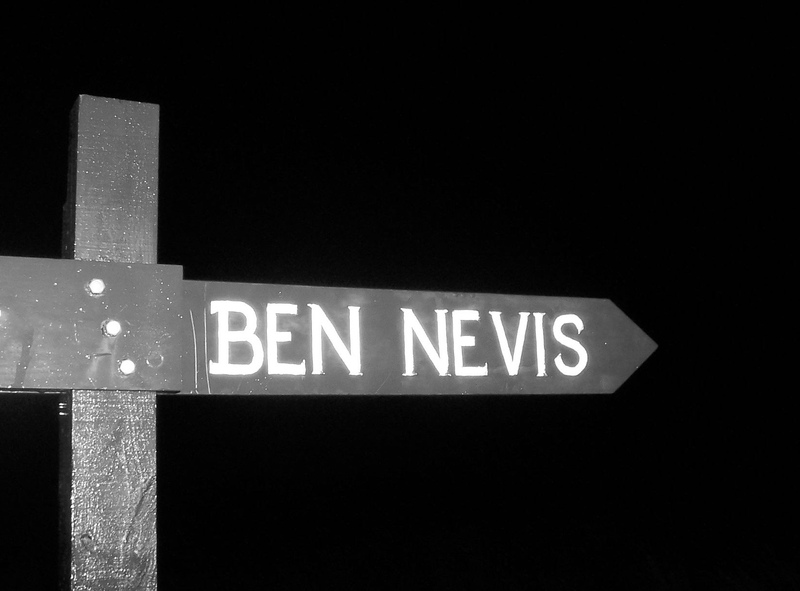 The first real test while climbing Ben Nevis in the dark comes when you reach the plateau at the Halfway Lochan. Here, walkers take a right turn and zig-zag up the scree slope towards the top of the mountain, while climbers navigate through the peat hags and then down towards the enormous scooped-out corrie beneath the north face. I got lost in the dark. I should have paid more attention to my navigation, but the paths suddenly petered out and the rain had turned to snow just as suddenly, sweeping over the ground and hiding terrain features. I didn’t carry a GPS or smartphone and before I knew it I had no clear idea of where I was. The snow was sticking to my boots and my clothes as I felt my way through the blizzard, my headtorch illuminating a crazy whirlwind of driving snowflakes in front of me. I sensed the ground drop away beneath my feet. I realised I was starting to descend to the river on the other side of the flat saddle, so I turned right, aiming for a faint path that I knew traversed the cliffs to the CIC hut. Again I sensed the shadowy bulk of the mountain somewhere high above. By this point it was gone seven o’clock and the storm was getting worse. I’d originally planned to bivouac near the hut to get an early start on the route, but as the wind picked up and the snow stung my face I suddenly realised I should stop as soon as I found shelter. It was one of those situations where I’d been blasé for too long and the situation was potentially quite a lot more serious than I’d given it credit for. I hadn’t eaten anything for a while, and now that my pace had slowed I was starting to feel cold. Sort yourself out, Alex. Shelter, warmth, water, food: these are the priorities right now. 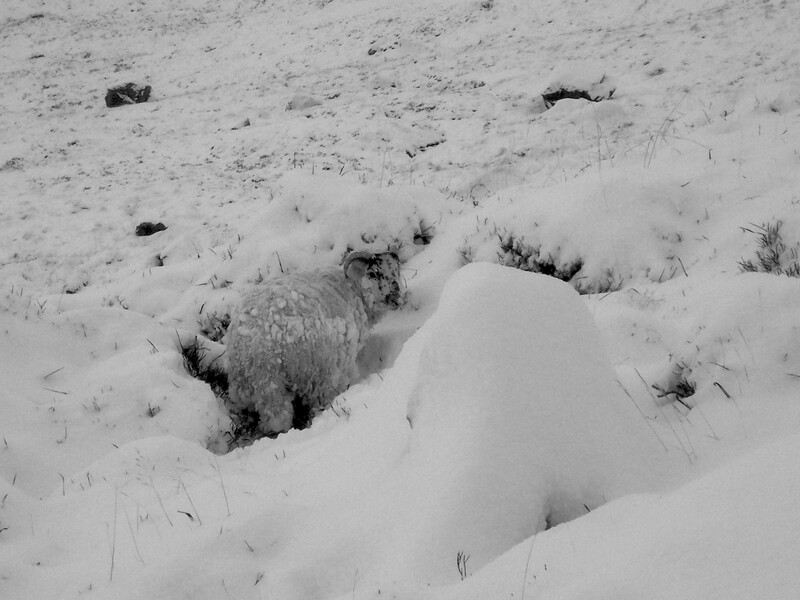 I stopped at the flattest and most sheltered patch of ground I could find, and stomped out a hollow in the heather, flattening down the wet snow that plastered everything. My waterproofs were streaming with water but I had a spare fleece in my rucksack and I’d get warm soon enough in my sleeping bag. So I unrolled the bivvy bag: a nylon tube with a zip at one end, big enough for me and my kit but without an inch to spare. Into it went my sleeping bag, the down gently inflating, and then I peeled off my waterproofs and dove in, leaving the sodden garments outside after securing them to the ground with a tentpeg. After grabbing some food and a water bottle, I left my rucksack outside too. I wriggled around and changed my socks – a challenging operation in such close quarters – before eating my cornish pasty and taking a swig out of my water bottle. Then I looked at my watch. Eight o’clock. I had many, many dark hours ahead of me, and I’d forgotten to bring any music to listen to or a book to read. Usually, a mountain bivvy is a completely different experience to sleeping in a tent. Your face is open to the mountain air and you feel more connected with the landscape – part of it instead of cut off behind the walls of a tent. But I have never felt so claustrophobic as I did that night. It wasn’t so bad at first. I was warm enough, and the mossy ground conformed beneath my body, forming a comfortable enough bed to lie on. I thought about my walk so far and about my objective for the next day (with a little more respect than I’d been thinking about it the night before). Then, as my thoughts quietened and I attuned myself to the mountain, the unease grew. I’d never used this particular bivvy bag before. I was completely sealed in, like a fabric coffin. I tried undoing the zip an inch or so, but the blast of cold air was so uncomfortable that I soon zipped it shut again. The roar of the wind was absolutely monstrous. It tore over the north wall above me, shrieking and bellowing like some insane chained demon clamouring to be free. A gale in the mountains is sometimes described as sounding like an express train, but this was worse, far worse; there seemed to be no pattern to it, no warning as another ungodly, earth-shattering scream broke over my hiding place in the heather. And there I would cower in half-sleep, the rational part of my brain completely overcome by the inhuman roar of the wind on the mountain. The wind drove the snow before it – just a pitter-patter of flakes dashed against the Goretex at first, but after an hour or so I felt the wet weight of it pressing down on my sleeping bag, flattening the down insulation and stealing my heat. The moment I realised what was happening was like a blaze of sheer panic. I’d never bivouacked in a snowstorm before; could I be buried, or suffocated? I thrashed about and dislodged the snow that had built up on my body. Half an hour later I had to do it again, then ten minutes after that. I slept in exhausted snatches. The cold penetrated every layer of insulation and at times I curled up in a ball, shivering uncontrollably just to generate some heat. The roar of the wind invaded my dreams. For a while, between three and five, I imagined that I’d already been lying there for days and the sun had never risen. It wasn’t my most comfortable night spent out on a mountain, and probably not one of my better ideas, all said. But I got through it, and at seven o’clock I made preparations to leave. The snow was soft and deep outside. A wall of snow had built up against one side of my body, sculpted by the wind, and as I emerged from my nylon cocoon it crumbled and collapsed into the hollow where I had lain. My waterproofs were buried under about a foot of snow, and frozen stiff as boards. It took some effort to make them pliable enough to put on again, and then I felt the uncomfortable trickle of melting ice against my skin. The water in my bottle was damn near frozen, too. Already I was forgetting how unsettled and disturbed I’d felt throughout the night. I could see the mountain above me now – a tremendous shape, the shadows of ridges and buttresses soaring white against white into the dawn sky. I began to walk. It was arduous. With each footstep I sank through fifteen inches or more of snow, which often hid inconvenient terrain beneath: a springy heather bush, a crack between two boulders, a sopping bog not quite frozen enough to support my weight. I wished I had snowshoes. The shape of the mountain changed as I passed beneath it. From a single mass of cliffs, the north face of Ben Nevis soon opened up to reveal the individual buttresses and gullies: Castle Ridge, Carn Dearg Buttress, No.5 Gully, Tower Ridge, No.4 Gully, and to the left, bigger than all the others, the N.E. Buttress. 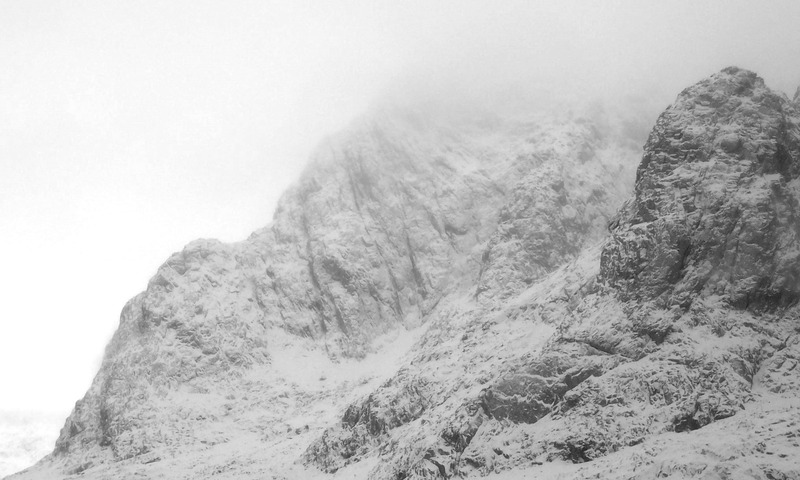 I’d climbed here before, earlier in the year, but for me a visit to this side of Ben Nevis was a rare treat. There was so much on this amazing mountain face I had yet to explore. I passed the CIC hut, half buried in new snow, and began to climb upwards over the rocky slabs that marked the start of the approach to the mountain’s main routes. Visibility wasn’t great – low cloud still blew over the crests of the cliffs, driving a little fresh snow and a lot of spindrift in front of it, and the flat lighting made features difficult to distinguish, even at this low altitude. I realised at once conditions would be disorienting on the plateau. But there were fresh footsteps leading in the direction of No.5 Gully, and I followed them, hoping someone would be ahead of me, breaking trail up my chosen route. Soon, I saw two climbers ahead of me on the near horizon, making tracks for North Trident Buttress, the mass of rock to the left of my chosen area of the hill. I didn’t catch up with them, but later – much later, when I returned to the Clachaig – I discovered that one of the climbers had been my friend Jamie B, a climbing instructor at the Ice Factor in Kinlochleven. They’d turned back on their route of choice due to poor conditions. No.5 Gully is a notorious avalanche trap. 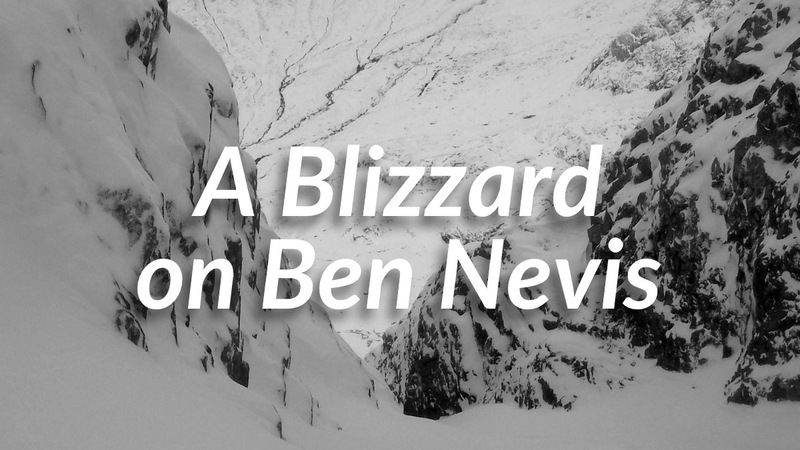 It kills and injures climbers most years, but in order to climb Ledge Route – otherwise one of the safest routes on Ben Nevis in avalanche conditions – you have to either climb part of No.5 Gully or cross it after a lengthy traverse to the left. I dug a pit in the snow to test for weaknesses, decided it didn’t look so bad, and made the choice to plough straight on up the gully. Above me, there were two possible starts to the ridge I could use. I hoped the first one would go. As a climber, I liked consolidated snow and crunchy ice beneath the points of my crampons. I didn’t appreciate the soft powder that had been blasted across the mountain, blanketing every feature and making each step a hazard. Unstable scree shifted beneath me as I carefully approached the gully, using my ice axe as an anchor, rammed firmly home into a blob of frozen turf or wedged into a crack in a boulder. ‘Typical early-season conditions,’ I muttered to myself as I eyed up the terrain ahead, imagining I had the experience to gauge the safety of what I now planned to do. It didn’t look so bad. The bed of the gully had filled in nicely, and a little way up I could see comforting rocks sticking out of the ground as the terrain rose up again to the first ‘ledge’ of Ledge Route, above the blank face where the ice weeps of the Curtain form later in the season. 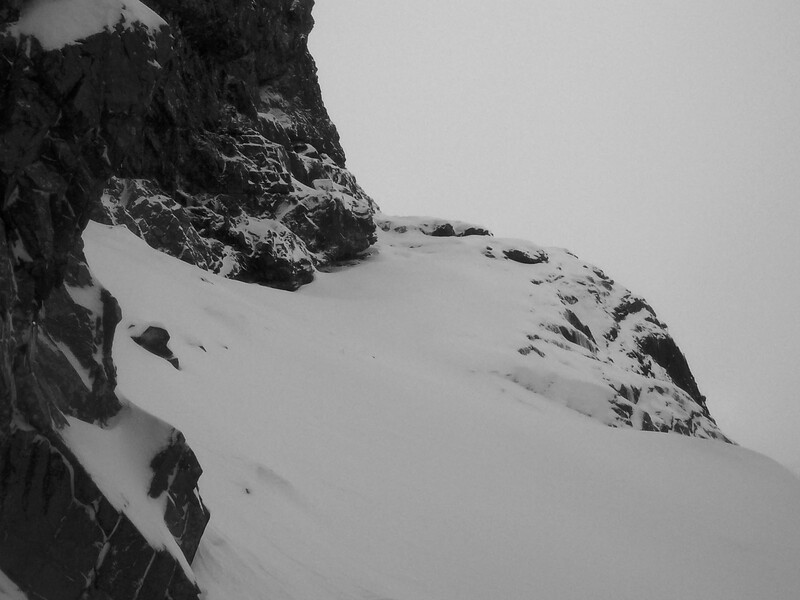 The snow of the gully bed engulfed me. I sank to my knees, then to my waist; after another step it was almost chest-deep, and I flailed around with my ice axe, trying to carve a trench through this shifting morass. Making any progress took an age. All the while I kept glancing up the gully, into the great white nothingness above, wondering if my avalanche assessment had been correct. Finally I made it to the ledge: a sloping slab of rock leading to the first pitch of the climb. In summer conditions there’s an easy scramble here, and usually in winter a good lathering of ice makes it easy to tiptoe up on the front points of your crampons. But today there was nothing but unconsolidated powder. I made it perhaps five or six metres up the slab before I started to feel extremely insecure. 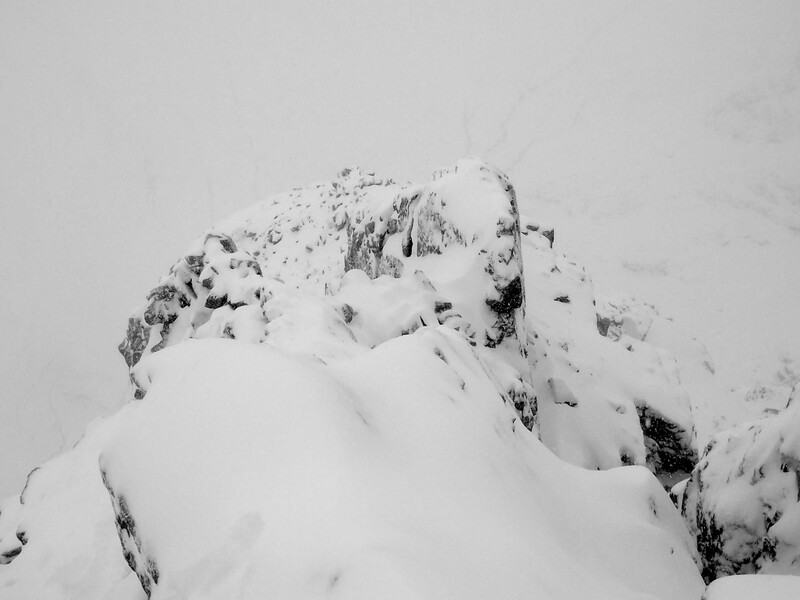 Spindrift was pelting me from above, blown over the crest of Carn Dearg Buttress from the other side of the mountain, and there was nothing for my crampons to engage with, just smooth slabby rock under a blanket of snow. I skated about looking for holds, trusting a single point to a nubbin of rock, wishing conditions were better. My boot popped off the hold and I slithered back down the slab, digging a furrow in the turfy rock beneath me. My heart pounded. I had another go, and another, but the slab wouldn’t let me pass – it was simply too unconsolidated, too insecure, to safely climb by myself. I would have to find another way up. There was another ledge somewhere above me, in the mists. 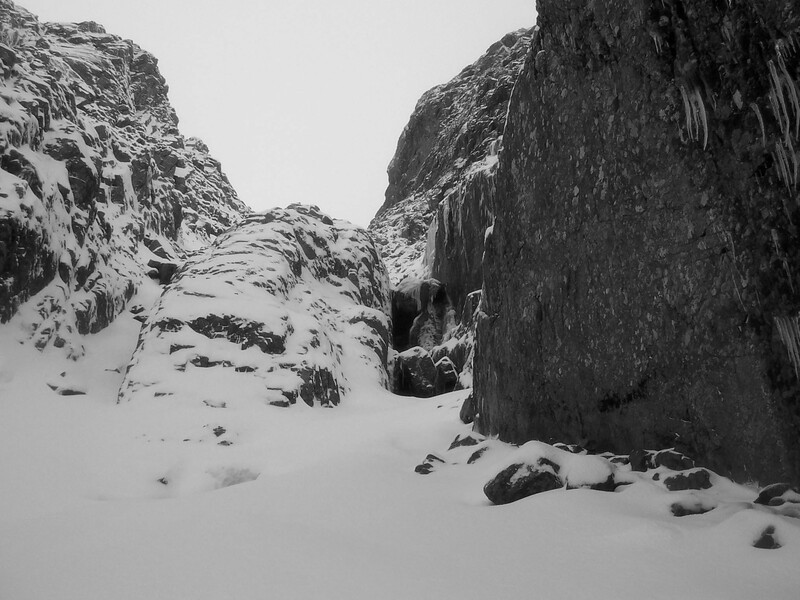 But that meant wading further up No.5 Gully, a prospect I did not relish in such conditions. I balanced the options in my head. I could turn back, of course. That would probably be the sensible course of action at this point, but my winter climbing skills were as yet unproven amongst my new group of Clachaig friends, and to be honest I didn’t really want to lose face. I wanted the tick. So I headed back for the gully. It was another poor decision. I managed to convince myself that, despite the quantity of loose and unstable snow, avalanche risk would actually be minimal – that because it was loose powder on top of a base of rock and scree, it was very unlikely that a real slide could develop. Local conditions weren’t right for windslab, so it was a reasonably sound theory. That didn’t make the gully any easier, though. I ploughed on up, eventually coming to an exposed chockstone pitch. In the middle of winter this is usually completely buried in a ramp of consolidated snow, but today it required scrambling skills. When I reached the next (and easier) start of Ledge Route, another shelf slanting off to the right towards the crest of the buttress, I checked my watch. To my astonishment, half an hour had slipped past since I’d been flailing around on the slab only a little way beneath. How had it taken so long to climb such a short stretch of snow? 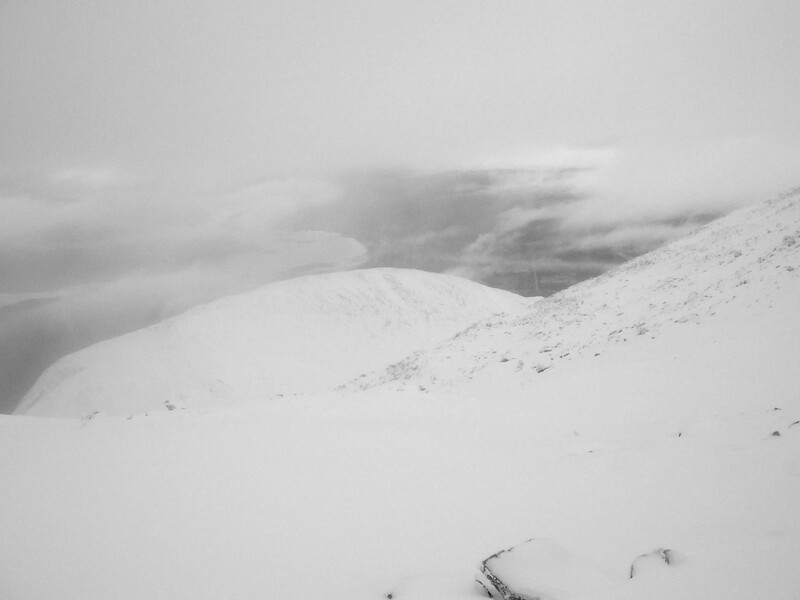 I now started to worry that I’d be overtaken by darkness while still high on the Ben, and with more snow forecast. Things got easier when I left the gully and started climbing the crest of the ridge. Ledge Route is the kind of climb I enjoy best. On my previous summer ascent, only a few months before, I’d loved the sensation of easy scrambling on a jagged crest with the sweeping views of Ben Nevis’s greatest cliffs all around me – scenes of inaccessible faces and classic routes alike. Now, with everything draped in a layer of snow and a little rime ice forming on the rocks, it looked very different. It was no longer an easy or friendly scramble set amongst more intimidating neighbours; it was a little intimidating itself. But there’s no difficult climbing anywhere on the route. It’s easy. The challenge – like all climbing, I guess – is all in your head. Away from the deep and suffocating snow of the gully, I made good progress up the ridge and at last it felt like my day involved some real climbing. My crampons scraped on rock and bit into frozen turf. I scraped with my ice axe for handholds, and, like all beginner winter climbers on easy mixed routes, I couldn’t resist the temptation to swing it overhead in the hope of getting a good stick in ice. But there was no ice, and all I ended up achieving for my efforts was to blunt the pick of my axe. The wind picked up as I climbed, howling and shrieking again. The demon was back. This time I was out in the open, however, and I didn’t feel claustrophobic and threatened as I had in my bivvy bag the night before. I continued to climb, past the exposed narrows where the drop to the left is incredible and mountaineers often get their pictures taken clinging heroically near the edge. By the time I reached the summit of the ridge and the end of my climb, my clothing was coated with ice and I rattled as I walked. Lumps of ice hung from tendrils of wool on my mittens. There was ice in my beard, in my hair, and my face felt like it had been scoured by a scrubbing brush thanks to the continuous spindrift barrage. That familiar burn in my leg muscles told me I’d feel it the next day, too. In short, I felt like I’d been climbing, and I thought about the tale I’d tell at the pub that evening. I didn’t get to see any views from the plateau. 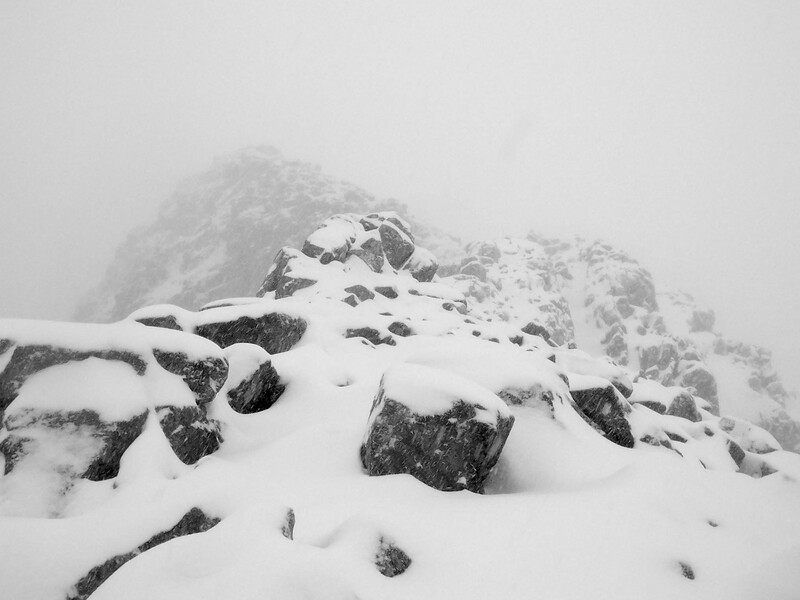 Pure, unending white greeted me in every direction: up, down, right, left … just white wherever I looked. I’d been in whiteouts before but they were still a little new and scary for me. And I’d never been in one by myself. For a moment the mists blew aside, showing me the enormous drop down into the corrie beneath. In an hour or so, I knew, the light would fail. 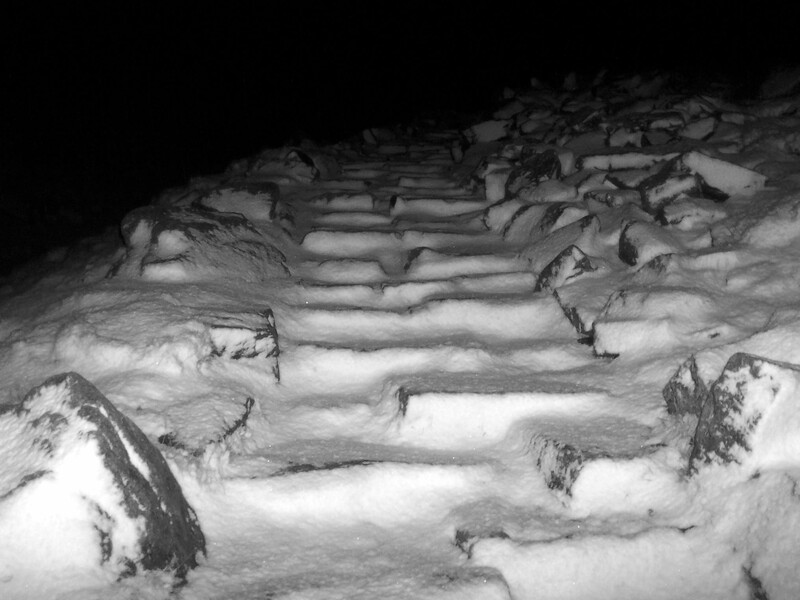 I was near the summit of Ben Nevis in high winds, the fresh snow would conceal any trace of the path, and more snow was forecast. One look at the map confirmed that I wouldn’t be attempting to get to the actual summit of Ben Nevis. 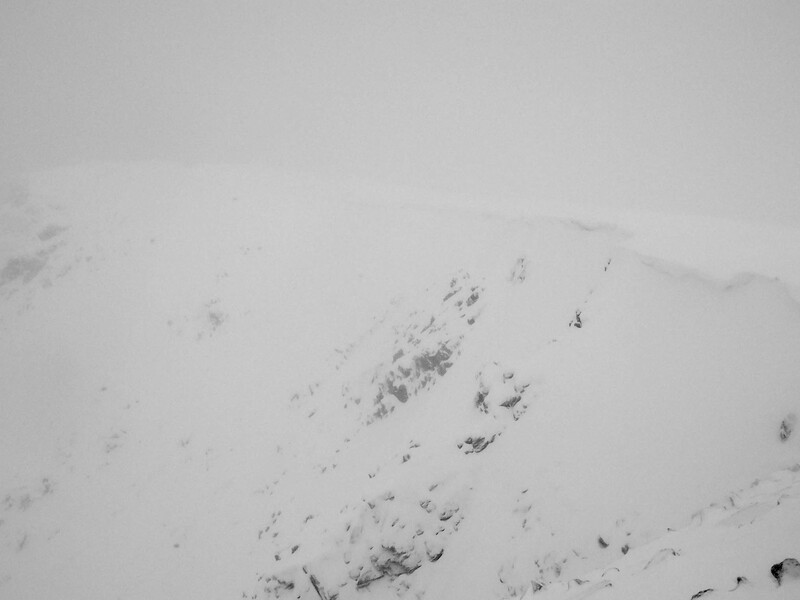 The top of Ledge Route is some way away from the observatory at the top of the Ben. Ordinarily I like to end a climb on a summit, but I’d been there before and I didn’t really have time. The best way off the Ben from the top of Ledge Route is to contour pretty much due south until you hit the Pony Track coming down from the summit. That was my plan – and it was a good plan – but I didn’t account for how slow my movement would be over the difficult terrain in such high winds. It’s about seven hundred metres from the Carn Dearg cairn to the Pony Track, and it’s mainly flat. Those seven hundred metres took me an hour to traverse. From a safe island atop a rock, I would take a step and sink up to my waist in shifting, freezing powder. Wading out of these natural pitfall traps, concealed amongst the litter of boulders and scree covering the mountain’s flank, was exhausting. I hadn’t eaten since back at the CIC hut and I wolfed down a frozen Mars bar as I stood there, melting snow trickling into my trousers, wondering why the hell I did this to myself. After a while I got a sense of the lay of the land and figured out how to avoid these bottomless drifts of snow. I tried to stick to the higher ground, but even that was laborious: fractured rubble lay in unstable heaps, covered in more snow. It might have been a little easier with trekking poles for balance, but all I had was an ice axe and it wasn’t the right tool for this kind of terrain. The wind tugged at me and battered me, first shoving me one way and then the other, assaulting me with fists of freezing air and spindrift whipped up from the north face. I fell over more than once. Trying to walk to a compass bearing in such conditions was very challenging. I tried to use the mountain’s contours to help me navigate, using the 1,100m contour as a handrail. But sticking to a contour is hard enough in perfect conditions if your navigation is rusty, and with the mountain actively trying to turn me into the next Mountain Rescue statistic it was a whole lot more challenging. I decided to get my head torch out when I realised I’d stumbled into the Red Burn instead of the path I was looking for. This is another notorious avalanche trap, a watercourse heading nearly due west off the mountain. Mountaineers often descend this way, but the slope can be highly dangerous. I knew I had to get out of there. Fortunately, it’s also a useful navigational waypoint; all I had to do now was aim due south and I was bound to find the track eventually. When I reached the Pony Track I hardly recognised it; it looked like any of a thousand depressions in the ground I’d seen on my way down Ben Nevis. But then I saw this particular trough aim off to the left at an angle, and I knew it was a switchback in the path. Then I saw a cairn, which confirmed my belief. I was at about 800m altitude, and I’d found the path that would take me down off the mountain in safety. I hadn’t made it yet, but I was out of the woods. That’s when the nervous concentration I’d been holding together for many hours relaxed, and I allowed myself a few minutes sitting in the shelter of the cairn, eating a little food and sucking on lumps of snow (my water bottle had long since frozen solid). My hands didn’t stop shaking for some time, and it wasn’t from the cold. I got back home at about 9.00 p.m. and, after dumping my gear in the drying room where the dangling lumps of ice would gradually drip in other people’s boots, I went to the pub. It was a quiet night. Lager John was propping up the left-hand side of the bar, near the picture of the naked man climbing the frozen ice pillar of Elliot’s Downfall in the 1980s, and he nodded at me as I approached. John’s an Englishman, voluntarily exiled to Glen Coe in his retirement, and he’s one of the most experienced mountaineers I’ve ever met. He’s the first of the Clachaig regulars new staff are introduced to. Although he doesn’t talk much, his adventures, relayed by the other bar staff, are the very stuff of Clachaig legend. I considered the question. For days I’d been thinking about this moment – how I’d stride up to Jack, or Rach, or whoever happened to be on duty that Wednesday night in late November, and I’d order a pint of Stag before telling my epic tale that would earn me my place in the unwritten, unending storybook. Surely I’d earned the right? But then I thought about how I’d felt while I cowered, awake and alert, in my bivvy bag while the storm raged around me. 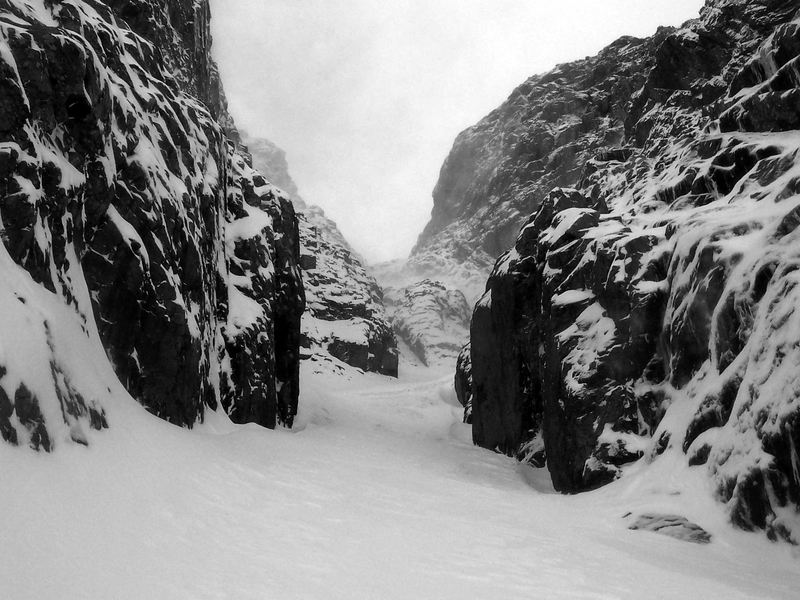 How the exhaustion and the cold had crept into my bones as I considered avalanches in No.5 Gully. How I’d wondered if I would ever get off the mountain at all after finishing my route. And that’s when it struck me. These tales, these legends … people don’t tell them about their own exploits, because a winter ‘epic’ usually comes about as a result of cumulative errors of judgement. Mistakes that can quite literally snowball and claim lives. Mistakes that do claim lives. These stories are told by other people about their friends to make light of the spectre that dances with us in these hills – the spectre of hypothermia, of rockfall, of avalanche. Of death. It’s easy to laugh and spin tall tales when a climber has done something stupid but survived to climb again. It’s very different when the Mountain Rescue volunteers turn up at the bar and drink their pints in silence. When you know not to ask them what has happened. So I ordered my pint of Stag from Jack, ignoring his unasked question and expectant smile, and turned instead back to Lager John, the quiet man who rarely talks about his own adventures. ‘Ledge Route,’ I said simply.